IBC high precision locknuts with a fine thread are used in high-precision applications due to their high accuracy. The locking systems that are integrated into thevarious locknuts allow easy and precise installation and guarantee permanent strength. 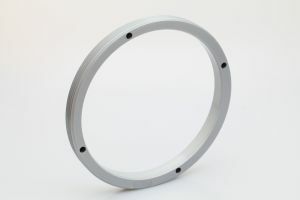 They do not change the circular cross-section of a shaft and do notproduce any grooves in the shaft due to additional changes,. Thanks to the very precise machining of the thread and the contact surface, IBC high-precisionlocknuts achieve a level of runout precision in accordance with ISO basic tolerance IT3. 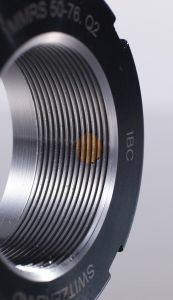 The various forms of IBC high-precision locknuts perform the most varied tasks. 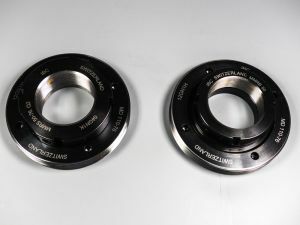 Depending on the axial loading, various broad high-precision locknuts areavailable. The locking elements are accessible axially or radially, depending on the configuration. When it comes to applications with a limited amount of space for installation or if it is necessary to save weight then we recommend our MMR series of precision locknuts. When using the MBA and MBC series in installation locations that are hard to reach the locknuts are secured with clamping screws that areaccessible axially. Due to its construction, this type requires a greater width, whereby the locking system in the MBA can slightly increase the axial preload of thelocknut and slightly reduce it in the MBC type. 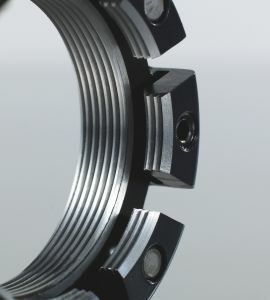 The MMRB version with a radial locking system uses the same cross-section as MBA and MBC locknuts and thuspermits greater loads and higher tightening torques. 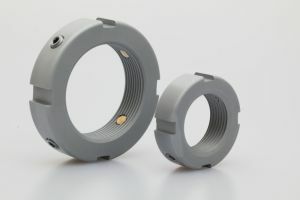 In addition, the MMRB and MBA series with built-in labyrinth seals are produced as the MMRBS and MBASseries.